Share the post "Look up to the sky and listen?" Is there anyone out there? Some think so and believe we may have received evidence of it. Using radio telescopes, astronomers have picked up brief bursts of energy which last only a few thousandths of a second from far beyond our own galaxy. Known as “fast radio bursts”, or FRBs, they were first detected in 2007. While we have only detected a handful of them, scientists have estimated that thousands of FRBs happen every day. The new signals, noticed by a scientific team using a radio telescope called the Canadian Hydrogen Intensity Mapping Experiment (CHIME), which was only set up last year, also include something rather special: a radio burst that repeats. This is only the second repeating signal ever recorded. The first one, recorded in 2015 and given the unassuming name of FRB 121102, was recorded in Puerto Rico by the Arecibo radio telescope. This new signal has a similar structure to FRB 121102, a discovery that has excited scientists. This could suggest that other signals with this structure might also be repeats. The structure of the signals depends on where they originate in space. The distance they travel, as well as the phenomena they encounter on the way to Earth, such as gas or plasma, can warp, scatter and twist the signals. Properties such as the brightness of the signal can be recorded, as well as the frequency. When these clues are put together, the team can estimate where and in what sort of environment the signals originated, like interstellar detectives. There are many theories explaining their formation, often involving neutron stars in various destructive scenarios. Neutron stars are formed when massive stars, far bigger than our own Sun, die and collapse. If one of these stars starts to spin rapidly in an area with a high magnetic field, signals like FRBs might be produced. Neutron stars also collide with each other, resulting in their destruction. This might be plausible for signals that are recorded once and then disappear for good, but it falls flat when used as an explanation for the repeating signals. Sometimes these rapidly-spinning neutron stars can start to fall apart under their own weight. Known as “blitzars”, they can result in the formation of a black hole. But as with the theory involving colliding neutron stars, a star that ends up being destroyed is not capable of sending repeating signals. Black holes, an area of space where gravity is so strong not even light can escape its pull, are also popular characters in these origin theories. As well as blitzars, events such as neutron stars falling into black holes or even black holes being bombarded by dark matter may have a role in creating these mysterious signals. The 13 bursts recently detected by CHIME are much brighter than any of the bursts recorded previously and have the lowest frequency of any of the bursts encountered so far. 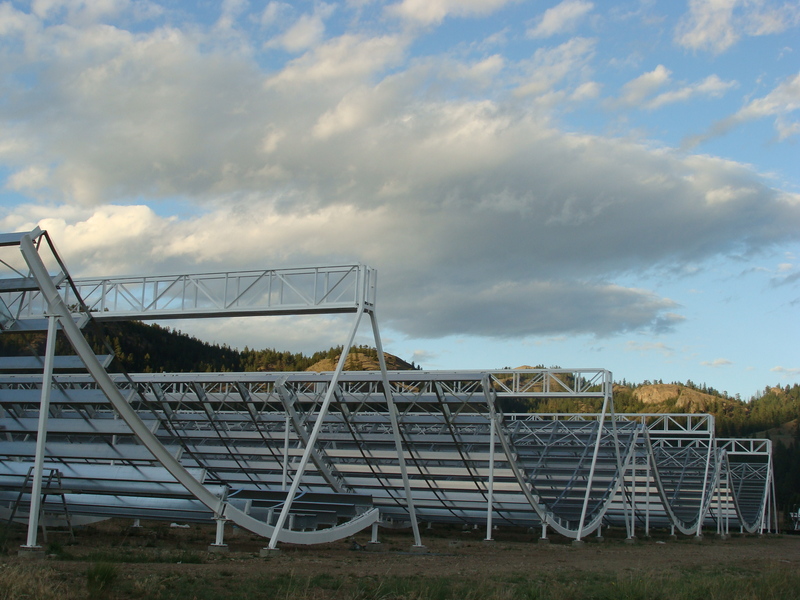 These bursts have a frequency of 400 megahertz (MHz), which is the lowest frequency that the CHIME telescope can detect. Signals recorded before had frequencies of around 1400 MHz. From this and by looking at the structure of the radio waves, the team suspects that these signals originated from dense regions of galaxies that experience the kinds of volatile activities suggested above, such as areas near black holes or the remains of a supernova. A supernova is an exploding star, one of the most energetic events that can occur in the universe. How far away these signals are can also be estimated. FRB 121102 came from a galaxy that’s full of stars in various stages of life, three billion light-years away, in a constellation known as Auriga. This new signal is believed to be 1.5 billion light-years closer to us, but to confirm this, the originating galaxy will have to be pinpointe; a task that is not always possible. When mysterious readings from space are received, there is always another explanation that is brought to the table. Professor Avi Loeb, based in the Harvard-Smithsonian Center for Astrophysics, has suggested that it could be a sign of aliens or, more precisely, alien technology. Rather than being used for communicating with other space-roaming beings, Loeb and his colleague Manasvi Lingam suggest that the signals are a by-product of transmitters the size of a planet used for locomotion. They speculate that the transmitters could be used to bounce light or radio waves off enormous sails to propel extra-terrestrial craft among the stars, like an immense sailing ship. It’s an intriguing and beautiful idea that no doubt grabs the imagination of science fiction lovers everywhere, but many scientists don’t consider this to be a highly likely option, citing the improbability that different civilisations from different regions of space are using the exact same signal in the same way. While no-one can say for definite where these cosmic puzzles come from and what causes them, scientists will be on the lookout for more. Not only could more readings pin down the causes, they could help us understand the matter that exists between galaxies, such as gas, dust and plasma, known as the intergalactic medium. For now, the bursts remain shrouded in mystery, which Shriharsh Tendulkar, author of the study, admits is part of their appeal. There is “a lot of fun in not knowing,” Tendulkar says. The signals could be signs of awesome natural phenomena, or maybe even the signs of an alien fleet, but one thing is for certain: they have captured our imaginations. The only thing left to do is to keep listening.